Gregorios N Bernardakis was born in Agia Marina near Mytilene, Greece in 1848. Internationally he is regarded as one of the most important grecists (ancient Greek philologists). He was also a textual critic and palaeographer. In Mytilene he attended the first three classes of the local grammar school ("gymnasium"), for the last three years he went to an Athens school. In 1867, while still a student at Athens University, his first work was published: "ΣΧΟΛΙΑ ΕΙΣ ΤΑΣ ΔΗΜΗΓΟΡΙΑΣ ΤΟΥ ΘΟΥΚΥΔΙΔΟΥ ΣΥΝΤΑΧΘΕΝΤΑ ΚΑΤΑ ΤΑΣ ΑΡΙΣΤΑΣ ΕΚΔΟΣΕΙΣ". In 1871, at the age of 23, he took his doctor’s degree at the philosophical faculty of Athens University. In the following years he was headmaster at two Greek grammar schools in Egypt, the Ambeteios School in Cairo and the Alexandria grammar school. 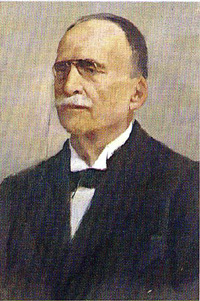 In order to improve his philological studies Gregorios later went to Germany (Leipzig and Berlin), France (Paris) and Italy. During this time he intensively occupied himself with palaeographical studies visiting monasteries and other Greek centres, while some of them were still occupied by the Turks. During his visit to the monasteries of the Holy Mountain of Athos Bernardakis discovered a new codex of Plutarch’s Moralia. At a meeting of German philologists in Gera (Thuringia) he gave a lecture on Sinaitical manuscripts and his visit to St. Catherine’s Monastery on the Sinai mountain. This lecture, published by Teubner in Leipzig, was met with a lively response, because Gregorios had discovered a papyrus ("Papyrus Bernardakis") in the library of St. Catherine’s Monastery. The papyrus contained a scholar’s Greek commentaries referring to a work by the scholar of law Ulpian who held high official functions under the Roman emperor Severus. Bernardakis modified many corrupt parts of this text. The jurisprudence calls these commentaries "Fragmenta Sinaitica" or "Scholia Sinaitica"; they contain valuable information on family law. In his book, the French lawyer and ancient philologist Rodolphe Dareste reported on Bernardakis’ discovery in detail and pointed out how important it was for the history of Roman law. From 1881 to 1894 Bernardakis was headmaster of the grammar school of Mytilene, which was occupied by the Turks until 1912. Following this position he was headmaster of the educational establishment "Zarifis" in Philippopel (Bulgaria) from 1895 to 1897. In 1898 Bernardakis was appointed professor for philology at the University of Athens. Here he taught for 25 years until 1923. He died in 1925. Bernardakis published a great number of philological texts. His favourite authors were Strabo, Plutarch and Thucydides. Among the outstanding works of his life are "Plutarchi Chaeronensis Moralia recognovit Gregorius N. Bernardakis" in seven volumes (1888-1896) at Teubner, Leipzig and over 1200 pages long "ΛΕΞΙΚΟΝ ΕΡΜΗΝΕΥΤΙΚΟΝ ΤΩΝ ΕΝΔΟΞΟΤΑΤΩΝ ΕΛΛΗΝΩΝ ΠΟΙΗΤΩΝ ΚΑΙ ΣΥΓΓΡΑΦΕΩΝ" (1908 and 1918²), edited by the Marasli Library in Athens. The Teubner publishing house entrusted the critical edition of Plutarch’s Moralia to Bernardakis because he had caught attention by two other editions he had done for them before; one on Strabo: "Symbolae criticae in Strabonem vel censura Cobeti emendationum in Strabonem" (see Cobet's answer in Latin on the last page of Prof. Ingenkamp's essay on "Ploutarchos"), Teubner/Leipzig 1877 and another one on Plutarch: "Symbolae criticae et palaeographicae in Plutarchi vitas parallelas et moralia", Teubner/Leipzig 1879. Bernardakis believed that a Greek philologist could only have a complete command of ancient Greek if he used it as a working language. Bernardakis himself wrote in ancient Greek and in Latin and spoke several European languages.